The Kamakura period is a period of Japanese history that marks the governance by the Kamakura shogunate, officially established in 1192 in Kamakura by the first shogun, Minamoto no Yoritomo. 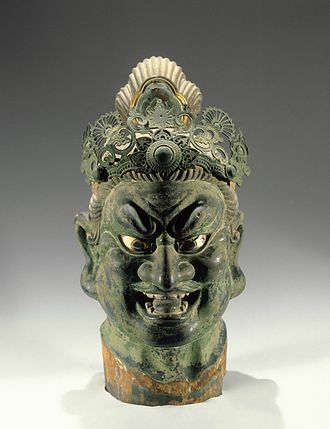 The period is known for the emergence of the samurai, the warrior caste, the Kamakura period marks the transition to land-based economies and a concentration of advanced military technologies in the hands of a specialized fighting class. Lords required the services of vassals, who were rewarded with fiefs of their own. The fief holders exercised local military rule, once Minamoto Yoritomo had consolidated his power, he established a new government at his family home in Kamakura. He called his government a bakufu, but because he was given the ancient high military title Seii Tai-shōgun by the Emperor, Yoritomo followed the Fujiwara form of house government and had an administrative board Mandokoro, a board of retainers, and a board of inquiry. 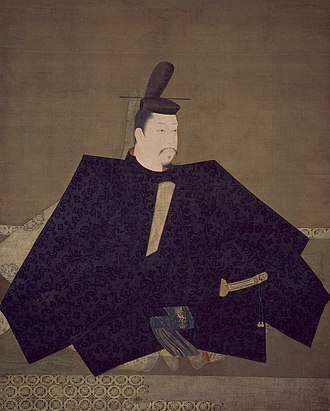 After confiscating estates in central and western Japan, he appointed stewards for the estates and constables for the provinces, as shogun, Yoritomo was both the steward and the constable general. The Kamakura shogunate was not a regime and although it controlled large tracts of land. 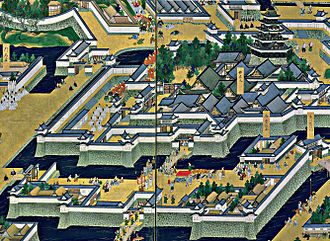 The regime continued warfare against the Northern Fujiwara, but never brought either the north or the west under complete military control, the 4th leader of the Northern Fujiwara Fujiwara no Yasuhira was defeated by Yoritomo in 1189, and the 100-year-long prosperity of the north disappeared. The old court resided in Kyoto, continuing to hold the land over which it had jurisdiction, despite a strong beginning, Yoritomo failed to consolidate the leadership of his family on a lasting basis. 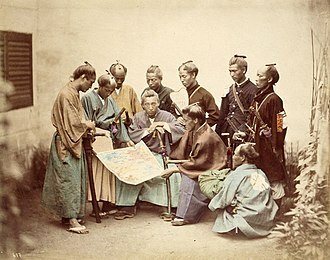 Intrafamily contention had long existed within the Minamoto, although Yoritomo had eliminated most serious challengers to his authority. When he died suddenly in 1199, his son Minamoto no Yoriie became shogun and nominal head of the Minamoto, but Yoriie was unable to control the other eastern warrior families. 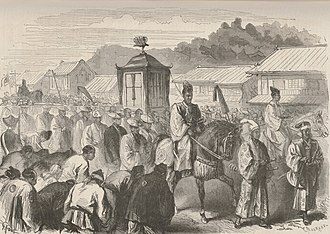 By the early century, a regency had been established for the shogun by Hōjō Tokimasa—a member of the Hōjō clan. The romanization of Japanese is the application of the Latin script to write the Japanese language. This method of writing is referred to in English as rōmaji. There are several different romanization systems, the three main ones are Hepburn romanization, Kunrei-shiki romanization, and Nihon-shiki romanization. Variants of the Hepburn system are the most widely used, Japanese is normally written in a combination of logographic characters borrowed from Chinese and syllabic scripts which ultimately derive from Chinese characters. It is used to transliterate Japanese terms in text written in English on topics related to Japan, such as linguistics, literature and culture. Rōmaji is the most common way to input Japanese into word processors and computers, all Japanese who have attended elementary school since World War II have been taught to read and write romanized Japanese. The word rōmaji literally means Roman letters, and in Japan it is often used to refer to the Latin alphabet itself than to any specific form of romanized Japanese. The earliest Japanese romanization system was based on the Portuguese orthography and it was developed around 1548 by a Japanese Catholic named Yajiro. Jesuit priests used the system in a series of printed Catholic books so that missionaries could preach and teach their converts without learning to read Japanese orthography. The most useful of these books for the study of early modern Japanese pronunciation and early attempts at romanization was the Nippo jisho, in general, the early Portuguese system was similar to Nihon-shiki in its treatment of vowels. 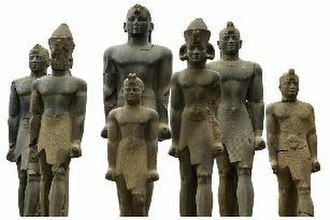 The latter continued to be printed and read after the suppression of Christianity in Japan, the Hepburn system included representation of some sounds that have since changed. The Nihon-shiki romanization was an outgrowth of that movement, several Japanese texts were published entirely in rōmaji during this period, but it failed to catch on. Today, the use of Nihon-shiki for writing Japanese is advocated by the Oomoto sect, during the Allied occupation of Japan, the government of the Supreme Commander for the Allied Powers made it official policy to romanize Japanese. Matthew Calbraith Perry was a Commodore of the United States Navy and commanded a number of ships. He served in wars, most notably in the Mexican–American War. He played a role in the opening of Japan to the West with the Convention of Kanagawa in 1854. Perry was very concerned with the education of officers and helped develop an apprentice system that helped establish the curriculum at the United States Naval Academy. With the advent of the engine, he became a leading advocate of modernizing the US Navy. Matthew Perry was the son of Sarah Wallace and Navy Captain Christopher R. Perry, Matthew Perry received a midshipmans warrent in the Navy in 1809, and was initially assigned to the USS Revenge, under the command of his elder brother. He continued in this capacity during the War of 1812, Perry transferred to the USS United States, commanded by the legendary Stephen Decatur, and saw little fighting in the war afterwards, since the ship was trapped in port at New London, Connecticut. Following the signing of the Treaty of Ghent which ended the war, Perry served under Commodore William Bainbridge during the Second Barbary War. He served in African waters aboard USS Cyane during its patrol off Liberia from 1819–1820, after that cruise, Perry was sent to suppress piracy and the slave trade in the West Indies. Later during this period, while in port in Russia, Perry was offered a commission in the Imperial Russian Navy, Perry commanded the USS Shark, a schooner with 12 guns, in 1821–1825. In 1763, when Britain possessed Florida, the Spanish contended that the Florida Keys were part of Cuba, in 1815 the Spanish governor in Havana deeded the island of Key West to Juan Pablo Salas of Saint Augustine. After Florida was transferred to the United States, Salas sold Key West to American businessman John W. Simonton for $2,000 in 1821. Simonton lobbied the U. S. Government to establish a base on Key West both to take advantage of its strategic location and to bring law and order to the area. On March 25,1822, Perry sailed Shark to Key West and planted the U. S. flag, Perry renamed Cayo Hueso Thompsons Island for the Secretary of the Navy Smith Thompson and the harbor Port Rodgers for the president of the Board of Navy Commissioners. 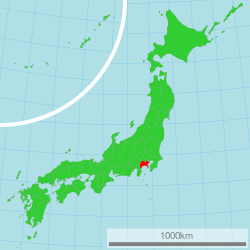 Kamakura is a city in Kanagawa Prefecture, about 50 kilometres south-south-west of Tokyo. Kamakura was designated as a city on November 3,1939, as of September 1,2016, the modern city has an estimated population of 172,302 and a population density of 4,358.77 persons per km². The total area is 39.53 km2, as a coastal city with a high number of seasonal festivals, as well as ancient Buddhist and Shinto shrines and temples, Kamakura is a popular tourist destination within Japan. Surrounded to the north and west by hills and to the south by the water of Sagami Bay. The natural fortification made Kamakura an easily defensible stronghold, to the north of the city stands Mt. 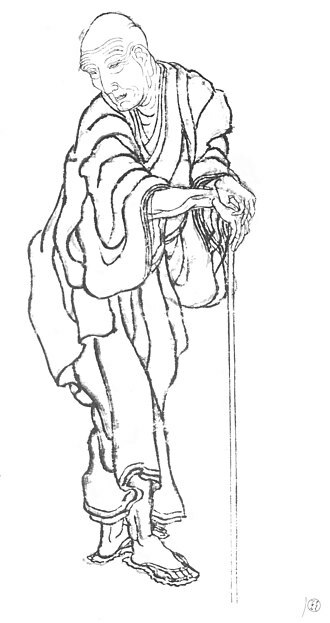 Genji, which passes behind the Daibutsu and reaches Inamuragasaki and the sea. From Kamakuras alluvional plain branch off numerous narrow valleys like the Urigayatsu, Shakadōgayatsu, Ōgigayatsu, Hikigayatsu, Kamakura is crossed by the Namerigawa river, which goes from the Asaina Pass in northern Kamakura to the beach in Yuigahama for a total length of about 8 kilometres. The river marks the border between Zaimokuza and Yuigahama, in administrative terms, the municipality of Kamakura borders with Yokohama to the north, with Zushi to the east, and with Fujisawa to the west. North-west of Kamakura lies Yamanouchi, commonly called Kita-Kamakura because of the presence of East Japan Railway Companys Kita-Kamakura Station, however, was technically never a part of historical Kamakura since it is outside the Seven Entrances. Yamanouchi was the border of the city during the shogunate. Its name at the used to be Sakado-gō. The border post used to lie about a hundred meters past todays Kita-Kamakura train station in Ofunas direction. Although very small, Yamanouchi is famous for its traditional atmosphere and these three great temples were built here because Yamanouchi was the home territory of the Hōjō clan, a branch of the Taira clan which ruled Japan for 150 years. Among Kita-Kamakuras most illustrious citizens were artist Isamu Noguchi and movie director Yasujirō Ozu, Kamakuras defining feature is Tsurugaoka Hachiman-gū, a Shinto shrine in the center of the city. A1. The Great Wave off Kanagawa, known as The Great Wave or simply The Wave, is a woodblock print by the Japanese ukiyo-e artist Hokusai. It was published sometime between 1829 and 1833 in the late Edo period as the first print in Hokusais series Thirty-six Views of Mount Fuji and it is Hokusais most famous work, and one of the most recognizable works of Japanese art in the world. 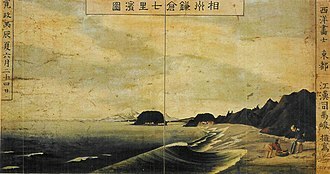 The image depicts an enormous wave threatening boats off the coast of the prefecture of Kanagawa, while sometimes assumed to be a tsunami, the wave is more likely to be a large rogue wave. As in all the prints in the series, it depicts the area around Mount Fuji under particular conditions, Hokusai began painting when he was six years old and at twelve, his father sent him to work at a booksellers. At sixteen, he was apprenticed as an engraver and spent three years learning the trade, at the same time he began to produce his own illustrations. At eighteen he was accepted as an apprentice to Katsukawa Shunshō, in 1804 he became famous as an artist when, during a festival in Tokyo, he completed a 240m² painting of a Buddhist monk named Daruma. In 1814, he published the first of fifteen volumes of sketches entitled Manga and his Thirty-six Views of Mount Fuji, from which the Great Wave comes, was produced from around c. 1830. From the sixteenth century fantastic depictions of waves crashing on rocky shores were painted on folding screens known as rough seas screens, Hokusai drew many waves throughout his career, the genesis of the Great Wave can be traced back over thirty years. Kōkans A View of Seven-League Beach was executed in middle of 1796, in both precursor works, the subjects are in the midst of a storm, beneath a great wave that threatens to devour them. Their rigidity and verticality evoke the shape of a mountain, while in the Great Wave the wave stands out because it is more active and aggressive. The earlier images are marked by the perspective traditionally used in Japanese painting. The Great Wave, on the hand, is depicted in a more western perspective. In the earlier prints the horizon is in the middle, whereas in the Great Wave the horizon is so low that it forces the viewers eye to the center of the action. The Japan Maritime Self-Defense Force, or JMSDF, is the naval branch of the Japan Self-Defense Forces, tasked with the naval defense of Japan. 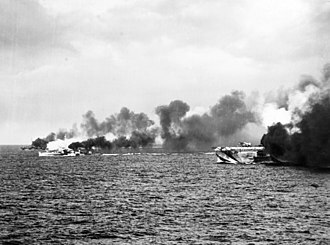 It is the de facto navy of Japan and was formed following the dissolution of the Imperial Japanese Navy after World War II, the JMSDF has a fleet of 154 ships and 346 aircraft. Its main tasks are to control of the nations sea lanes. 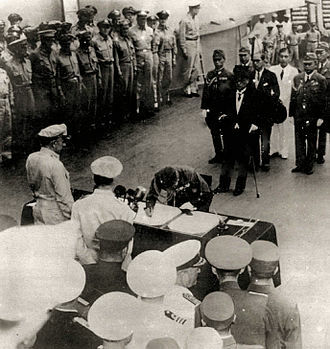 It participates in UN-led peacekeeping operations and Maritime Interdiction Operations, Japan has a long history of naval interaction with the Asian continent, involving the transportation of troops, starting at least with the beginning of the Kofun period in the 3rd century. 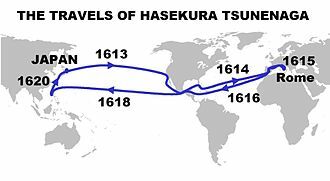 Following the attempts at Mongol invasions of Japan by Kublai Khan in 1274 and 1281, Japan undertook major naval building efforts in the 16th century, during the Warring States period, when feudal rulers vying for supremacy built vast coastal navies of several hundred ships. Around that time, Japan may have developed one of the worlds first ironclad warships, in 1588, Toyotomi Hideyoshi issued a ban on Wakō piracy, the pirates became vassals of Hideyoshi and comprised the naval force used in the Japanese invasion of Korea. 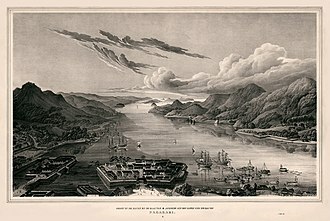 Japan built her first large ocean-going warships in the beginning of the 17th century, in 1613, the Daimyo of Sendai, in agreement with the Tokugawa Bakufu, built the Date Maru. 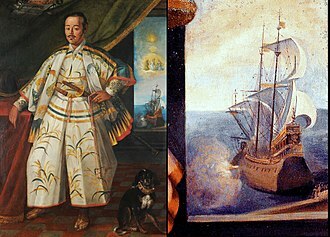 This 500 ton galleon-type ship transported the Japanese embassy of Hasekura Tsunenaga to the Americas, from 1604 onwards, about 350 Red seal ships, usually armed and incorporating European technology, were commissioned by the Bakufu, mainly for Southeast Asian trade. 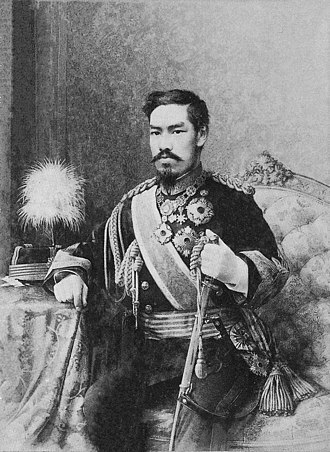 From 1868, the restored Meiji Emperor continued with reforms to industrialize and militarize Japan to prevent the United States, on 17 January 1868, the Ministry of Military Affairs was established, with Iwakura Tomomi, Shimazu Tadayoshi and Prince Komatsu-no-miya Akihito as the First Secretaries. On 26 March 1868, the first Naval Review was held in Japan, with 6 ships from the private domainal navies of Saga, Chōshū, Kurume and Hiroshima participating. The total tonnage of ships was 2252 tons, far smaller than the tonnage of the single foreign vessel that participated. Shinbashi is a district of Minato, Japan, located south of Ginza, west of Tsukiji, east of Toranomon and north of Hamamatsucho. 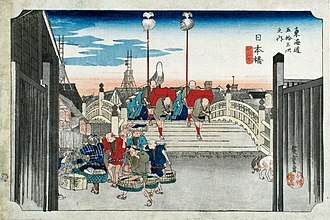 Shinbashi means new bridge in Japanese, the area was the site of a bridge built across the Shiodome River in 1604. The river was filled in. 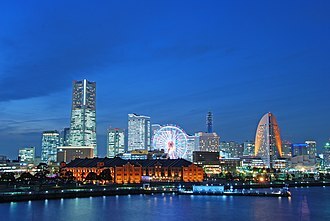 Shinbashi was the Tokyo terminus of the first railway in Japan in 1872 and it remains a major railway hub and has since developed into a commercial center, most recently with the construction of the Shiodome Shiosite high-rise office complex. 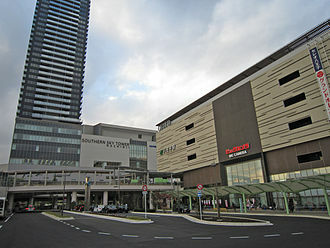 Reconstructed Shimbashi Station, which now houses a museum and restaurant, nakagin Capsule Tower modular commercial-residential high-rise. In addition ANA subsidiary Air Japan has some offices in Shiodome City Center, in the late 1960s All Nippon Airways had its headquarters in the Hikokan Building in Shinbashi. 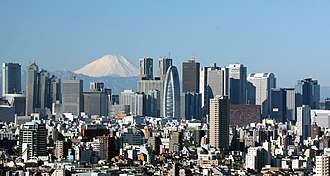 Other companies in Shinbashi include, Dentsu Kyodo News Nippon Television Nittsu Panasonic Electric Works Shiseido Softbank Yakult In May 1967 the headquarters of Asatsu moved to Shinbashi, the headquarters moved to Ginza, Chuo in July 1995. Lake Ashi, referred to as Hakone Lake or Ashinoko Lake, is a scenic lake in the Hakone area of Kanagawa Prefecture in Honshū, Japan. It is a lake that lies along the southwest wall of the caldera of Mount Hakone. The lake is known for its views of Mt. Fuji, its numerous hot springs, historical sites, the lake is located on the Tokaido road, the main link between Kyoto and Tokyo. A number of boats and ferries traverse the lake, providing scenic views for tourists. Several of the boats are inspired by the design of sailing warships, most visitors to Lake Ashi stay in one of the hotels or ryokan located in the area to visit some of the local attractions. Hakone Shrine is a shrine that has been visited by shogun, large sections of the Old Tokaido road are preserved here. Onshi Park was the retreat for the imperial family that is now a public park. Taking the aerial tram Hakone Ropeway to The Great Boiling Valley, from Togendai on Lake Ashi, the Hakone Ropeway aerial tram connects to Sounzan, the upper terminus of the Hakone Tozan Cable Car funicular railway. Hakone volcano from the SW.
Perry attacked and took San Juan Bautista (Villahermosa today) in the Second Battle of Tabasco. Military humor: Unofficial insignia of the "Tonkin Gulf Yacht Club" – aka U.S. 7th Fleet. The then-commander, Vice Admiral Scott R. Van Buskirk in 2010. The former district government office of Higashi-Yamanashi ("East Yamanashi"), Yamanashi. The building has been reconstructed in the "Meiji village" museum in Aichi. 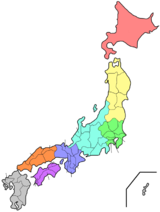 Districts of Japan. Notice that these are the remaining areas of formerly large districts, as towns merged into cities which split off from the districts. The command pennant of the Commander, Submarine Squadron 16 (COMSUBRON 16) above the squadron's headquarters at Naval Submarine Base Kings Bay, Georgia. Adult mew gull. Anchorage Coastal Wildlife Refuge, Alaska.